If McDonald’s really wanted to have targeted marginalized groups then an equivalent ad would be a white server bringing in a black man into McDonalds followed by the words ‘Come as you are’. The controversy revolves around the French McDonald’s ad (See Previous Post) and wether or not this ad was ethical. I’ve defined an ethical ad to be one that communicates to a target audience a product that the company wishes to sell or wishes to position itself in the consumer’s mind. I’ve defined an unethical ad as being one that creates controversy or publicity for publicity’s sake. It all comes down to intention. What was McDonald’s trying to gain out of this ad? Why do they target a marginalized group? To understand the ad we have to look at the larger campaign: ‘Come as you are’ is the message. See the difference? This ad isn’t controversial because it doesn’t target a marginalized group. They are practically two different ads running on supposedly the same campaign. What this says to me is that McDonald’s created this ad for publicity’s sake. The irony however is that this ad worked. I asked my LGBT friends what they thought of this ad. The vast majority see McDonald’s in a more positive light. They felt the ad made them feel inclusive and they were glad they felt like a company was taking them seriously as both a market/ consumer group and as people that could actually be depicted on television. No one however felt more inclined to eat McDonalds, but that’s perhaps because most of them didn’t eat it before. A lot of them did ask the question: “What do gays and McDonalds even have in common?”. Thats a branding issue however and perhaps worthy of its own blog post for a later date. 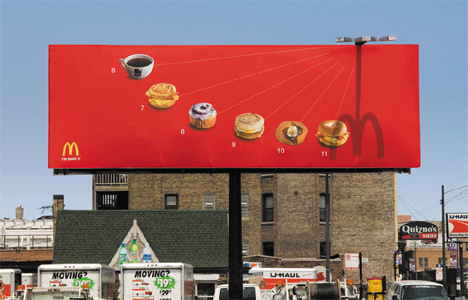 An outdoor ad by McDonalds that I find to be incredibly genius. I don’t know about you but I would definitely be standing with my cellphone out just trying to catch something. Interactive, contemporary and clearly visible. This ad does a new twist (Interactive Game) on something old (Billboards). What time is it? Pancake time! or no matter what time it is, its McDonald’s time.